For every fracking ban, there is a wingnut enviro pulling the strings. In Lafayette, it was Cliff Willmeng. You remember Cliff and his middle finger, don’t you? In Boulder we had Wes Wilson – the man who likened energy production to slavery. Now please welcome with a big round of applause, Denver frack ban crusader and science denier Sam Schabacker! Schabacker hails from Boulder County and is the local front man for the radical environmental group Food and Water Watch based in Washington, D.C.
His douchebaggery hobbies include: predicting the apocalypse, supporting his buddies in the Occupy movement, helping the poor by driving up energy prices, and standing up for labor rights. He accomplishes most of this by running small chicken farms out of business to drive up the cost of food, and shutting down oil and gas operations to increase the price of fuel while at the same time putting people out of jobs. Sam is part of the new generation of highly-paid activists who hop from issue to issue searching for controversies that will pad their donor base with millionaires and expand their lobbying influence over government. 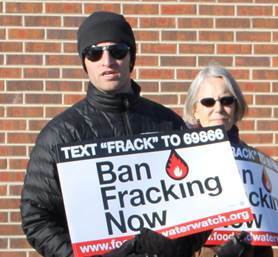 The campaign tactics by Food and Water Watch to ban fracking rate five stars on our mock-o-meter, like when they delivered 44 boxes full of anti-fracking petitions to North Carolina’s governor -– only the boxes were EMPTY. When Sam can’t get backing from the Colorado community, he just makes up supporters to endorse his fracking ban proposals, like his failed effort in Boulder County. FYI — That’s a tactic used almost exclusively by Washington lobbyists known as Astroturf lobbying, cause the grass above those roots is fake. Then there was the time those lefty whackos at Food and Water Watch altered official government documents to hide the fact fracking had NOT contaminated groundwater. Also on the list of ridiculousness was their failed effort to forge the signatures of some high-profile chefs on a petition to block fracking in California. Most environmentalists try and hide their true intentions, claiming they just want a government nip and tuck here and there to fix the perceived problem. But we’ll give Schabacker credit for going on record to state his true intent. “We believe that fracking is inherently unsafe and should be banned,” Schabacker told the Pittsburgh Post-Gazette. Schabacker’s latest whack notion is that fracking in Denver should be blocked to prevent discrimination and environmental racism. Schabacker and other greenies on Tuesday delivered letters to Denver Mayor Michael Hancock and the city council demanding a moratorium on fracking until such time as they banned it. Word of caution to Hancock, you might want to make sure those letters actually contain words, and are signed by real people, with their consent. Schabacker’s not exactly a fount of credibility.